I am wondering if anyone knows how to make a personalized fading banner for my website. I have sent you an email, you may wish to edit your post and remove your email address - stops spamming. Just wanted to see if there was an update on the drop-down menu you were helping me with. I'm very excited! Nathan is on vacation right now and he didnt have time too. But if you want i can setup your menu for you later once I get the code. That would be fantastic! I'm wanting to show the final website to my boss this afternoon so we can go live with it. Again, you guys rock and I really appreciate your help!!!!!! I'm so sorry I couldn't give you the code and I couldn't do this for you. Sorry about not replying. My email has gone into the bounce list - again. This means I'm not receiving any email notifications which is delaying my replies. I just went to my profile and I see every one replying yet I haven't got any emails from the Yola Forum for days. I am planning on changing my email because it keeps ending up in the bounce list for some reason. I'll have that menu for you on here soon. Sorry for the delay. No worries! I really appreciate everyone's help, and my boss loved the example I showed him. So once it's set-up, we're ready to go live. So excited! Thanks a million! Can't wait to see your site live. I bet it's great! www.Crestviewah.com as our old site. Did you get paid to build this? Just my hourly pay :) You're too kind! Thank you for the comment! Can you make the the domain transfer code as Yola will not give this to me. Down the page, it explains something about an authorization code? @bewarethebeeman: You'll have to get the EPP/authorization code from your current domain registrar to transfer your domain to Yola. 2, What URL do you want it to direct to. Any update on the drop down menu? My last day is tomorrow (Friday), and I would love to get it finished before I leave the company. Really, I can't tell you enough how much I appreciate your help! Also, can you help me implement it on my site? This will make the old menu go away and will add the new one. Can we make it a light blue on hover? Also, where can I find the site tracking code area to post this drop down menu code? P.S This is the blue one. That looks awesome! I hate to ask, but I think the "more" section may deter people from looking at our hours, etc. Can we add a menu item between home and services page titled "About Us" that contains the "Staff," "Tour the Clinic," "Location," "Hours," and "Pharmacy" pages? I think this will allow it all to fit on one line. I understand if there is not time, just thought I'd ask. Thank you so much for everything. If it's possible, can you just reply that it can be done. Otherwise, I'll take it as it is. Jeremiah, I'll do that right now and be done in 10-20 mins. I'll post the code here if that's how you want it. If that's not how you want it, I can change anything you want. Okay, awesome! I'll post the instructions below on how to implement it to your site. Very cool! I look forward to the code and instructions! The redirect timer might take a little longer because I need to figure something out first. It's okay, Mike :) The preloading images script does use lots of vars though. To implement the menu to your site, please follow these steps. 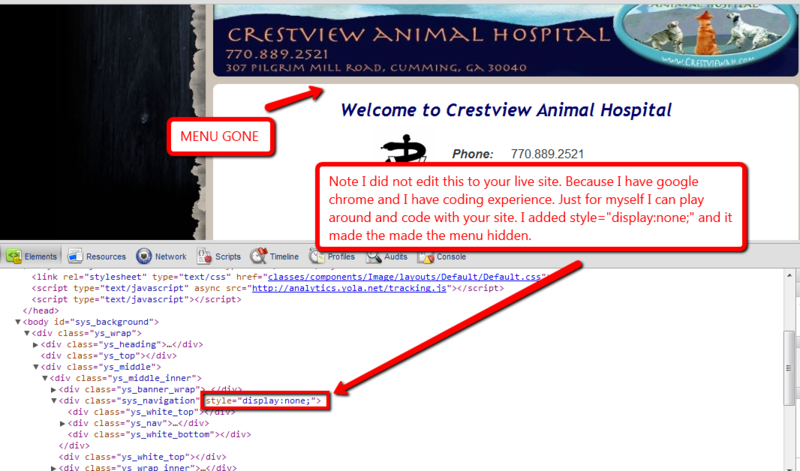 Save the Custom CSS and make sure "Disable Site CSS Overrides" is unchecked. 3. Click "Save" on the HTML Widget. Repeat steps 2 and 3 on each page of your site. If you have any issues with this, please let me know. Still not working. Surely I am doing something wrong?? All that happens is that I have my original menu plus the old menu above it. Plus, in Nathan's example page, he had the new menu that did not have the "More" selection. However, the html code posted still gives me that old menu....I need the new code, preferably that adds a gray background, and a code that will make the old menu go away. Any help is greatly, greatly appreciated!! I'm pretty sure your a little frustrated because it is your last day but we will fix all this. I'm going to go and get his code. But you want just a normal grey background with those colors? Shawn, that CSS you gave him will not work because you can't put style tags in the Custom CSS. Jeremiah, I'm going to get a whole code together that'll give it a grey background and with the new HTML and everything. Well it took a while. Can you please help me fix the code for the website??? Can we give the menu a gray background? I want it to look exactly like you're example. it would look right with the new menu. I guess what I was asking is that can we make the selections Home, About us, etc a different color other than white so that they show up better (it's hard to see the buttons I feel when it is a white button on a white background). So, I got the old menu to go away, finally. So know really all I need is the CURRENT code for the tester3 site from Nathan so that I can add it to the html widgets on each of my pages. Compare my site (http://crestviewah.com) to the menu on the tester page (http://tester3.yolasite.com/menu.php). I hope I'm not too confusing. I don't see the menu on your site at all. I'm posting the new code with a grey background below. Sorry, I'm still working on it. But I added something cool to the example page. See: http://tester3.yolasite.com/menu.php I took a screen shot of your site, blurted out the menu in the screenshot, put it as the background image on a div and then I put the menu in the div. Just did that so we can see if the menu fits and stuff. I love it!! - The new example is sweet!!!!! Do you guys have the code for it, or are ya'll still tweeking it? You can select a color here: www.colorpicker.com and then copy the HEX code and then I can put that in for you really quick. Remember, keep the HTML, only replace the Custom CSS, the HTML widget can be left how it is - the CSS will make the changes. IT IS NOW PERFECT!! I CAN'T BELIEVE IT!!! Awesome! Your site looks spectacular! I'm so glad you like it! :) It looks exactly like it does on the example page doesn't it? That screenshot way I did it is pretty neat. Yes, your site is perfect now! Sorry about that... I accidentally logged in with my other gmail account. Anyways.... Great job helping everyone Shawn and Nathan! You guys are the best! I know I have asked a favor already but I'd greatly enjoy it if you helped me out with a tough code again. I'd really like it if you could make a code that is pretty much a input box with a submit button. When you type in something and click the button it changes the width of a .swf component. Mike this is totally possible and easy! Very easy. Could I get the code of the swf. Then you will get you code within an hour. Just type in 'swfgoeshere' into the place where the .swf goes, and I think I'll be manage to change it. Also, IF POSSIBLE, make so that the height could be edited as well. this is optional- you don't need to do this, but it would be nice if you could. Thank you. //This will be the general width of the swf. //This will be the general height of the swf. //This is the text you have to enter inside the input. //Two vars to get the value of the input. //Two vars would not be needed. //The Message for the empty error. You can change this if you can. //The if to make everything work. //animation effect but it would not work. Also, all the <!--TEXT HERE--> in HTML and //TEXT HERE are just Comment tags, telling you a little about the code. Thank you so much! This code is such a major help! Thanks. You can post the code on this post or on that one, it doesn't matter.